I have been trying to use SQL 2008 for a new project, but I just broke down and decided to go back to SQL 2005 so that I can be productive. Even after installing Visual Studio 2008 SP1 Beta I still can't get Visual Studio 2008 to play nicely with SQL 2008... Tools like Schema Compare apparently still don't support "SQL 10" according to the error messages, and there still aren't any SQL 2008 specific database project types. To be clear I haven't had any problems with SQL 2008 itself, just a lack of tools support. I'll be speaking on Enitity Framework development at the Minnesota Developers Conference 2008 on September 9, 2008 in Minneapolis. Check out the website (http://mdc.ilmservice.com/) there are a ton of great speakers! It should be a great event, so register early. With 45 minutes to go before a presentation to 500 developers in Omaha, Microsoft Evangelist Mike Benkovich (right) is writing a new demo from scratch with help from his manager Brian Moore (center). It's not that he wasn't prepared for a presentation that he's given several times before in other cities, it just that he thought his existing demos were a little "boring". Nothing like an untested demo in front of a live audience to make things exciting! MINNEAPOLIS, MINNESOTA - Microsoft is actively hiring developers to staff a new development team that will be based in the Twin Cities. The group will be working on parts of Microsoft's new Expression Studio tools for creative professionals. Expression Studio competes directly with products from Adobe, and Doug Olson, and Bob Pappas, the managers for the new Microsoft team are both alumni of Adobe product development teams based in Arden Hills, Minnesota. Microsoft has an existing sales and consulting office located in Bloomington, Minneapolis, but there isn't space available in that office for the new Expression team, and so they are currently shopping for office space, location TBD. The open positions are for senior Software Development Engineers and Software Development Engineer Testers working with C# and WPF. This a rare opportunity to work on a cutting edge Microsoft software product, and live in Minneapolis. Interested candidates should visit http://members.microsoft.com/careers/default.mspx. I was standing at the back of the hall with one of the convention center security guards, who doesn't now anything about Microsoft, but has probably watched a lot of keynote speeches over the years. About an hour into Bill's presentation he turned to me, and said, "Wow, he really knows his stuff doesn't he." The view from mission control at the back of the hall. The technician on the left is running the teleprompter for the speakers (no most of them don't do it all from memory... but I'm not sure about Bill). FedEx had a major demo in the keynote showing off a cool new OBA application they've developed to integrate package shipping and tracking into Outlook. At the end of the demo this FedEx delivery guy ran up on stage with a package for Bill. The box contained a custom Guitar Hero guitar that is going to be auctioned off to some lucky ODC attendee. 2. Microsoft and CMP Media have just launched a new Resource Center for MS Silverlight site for developers (http://www.ddjresources.com/silverlight/) this looks like another great resource. I have adopted a new approach to personal email management that I thought was innovative enough that it is worth sharing. The problem being solved is to try and find more effective ways to manage my inbox, while reducing the number of people and businesses that I give my primary personal email address to. A secondary goal is to track which businesses use my email address to spam me with unwanted third party junk email, and then easily block that email. So here is the approach: I have a dedicated domain name "scrappydog.com" with just one email user (me). All email to any email address in the scrappydog.com domain lands in my inbox. This allows me to created a separate dedicated email address for every organization I do business with, and I can create a one off random address for any interaction I want. Then I can create a single inbox rule to route email addressed TO wellsfargo@scrappydog.com straight to the trash after I close my account there, instead of ten different rules for all of the different addresses they send me email FROM based on different marketing campaigns. Important point to note: What makes this so simple is that I'm routing ALL the email for this domain to a single inbox, and so there is NO SETUP for a new address, I just make them up on the spot. And I can easily create rules to make them go away. Atlassian has just announced a SharePoint Connector for Confluence, their very popular wiki product (Atlassian also makes JIRA the issue tracking system). Confluence is a Java based product, and SharePoint (MOSS 2007) already has wiki functionality included. So why am I, a Microsoft employee, highlighting this announcement? The wiki functionality in MOSS 2007 is great, but it's limited, and it doesn't meet the needs of all customers. Confluence is a mature popular product which some of my large enterprise customers are currently using. Those customers are also using MOSS 2007 and this product will let them bridge the two together into a single user interface with shared search provided by MOSS 2007. I think this is a great example of the sort of Software + Services (S+S) integration that we are working to highlight with core parts of the Microsoft stack acting as the glue to tie enterprise applications from a variety of vendors together for improved user experience. I had an interesting meeting with a new startup this morning. I can't tell you their name, or much about them, but I there are still some interesting bits worth sharing. This is a very early stage company that just secured $3+ million in VC money. Up until last week they were primarily funded by the three founders credit cards. They are doing business in the financial services space, and while they aren't going to be dependent on the web for their revenue, they do see the web as a key differentiator and value add to their business model. I was asked to come in and give them a briefing on the Microsoft platform and how it fits with their plans. We had an interesting discussion of the process of selecting a technology platform in a green fields opportunity like this. A key point that I made was that in a situation like this where a startup company is planning to develop a large custom application from the scratch the most important consideration isn't necessarily the licensing cost or capabilities of the platform nearly as much as the availability of talent to actually do the work. There are obviously lots of factors that go into a "bet the business" decision on a technology platform, but being able to staff up your startup is certainly a key one. Get the latest code from Source (Un)Safe. Clean (delete all bin and obj directories). Compile 65 VB.NET 2005 projects individually in dependency order (NOT using a master solution file). Copy most of the build output to a common bin directory. Run an InstallShield script that packages the files in the common bin directory into an *msi file. Copy the resulting *.msi file to a turnover directory. Email QA to let them know there is a new build available. And here is the bug: It turns out that all ItemGroups in an MSBuild script are processed BEFORE all Targets! So this means that my CompileOutput item actually is based on the files that were generated by the PREVIOUS build! The insidiously subtle part of this is that builds usually generate the same output, so the script "works" except for the first time new file is added, or the first time after a broken build that didn't generate all of it's output files. I ran into an interesting .NET Remoting problem yesterday: Users on Terminal Services were stomping on each other running an app with a "private" remoting server that hadn't taken into account the possibility that multiple user could be trying to run it simultaneously on the same computer. On a standalone workstation the session id is zero (0). The console session on a server is also zero (0). I've been getting some emails lately at my personal Gmail account from people at Microsoft with a freestanding "J" or "L" at the end of some sentences... emoticon like syntax and placement, but more cryptic... I thought I had missed the memo on some new internet meme or shorthand, but it turns out it's just a "feature" of how Outlook translates some standard emoticons into images. Here is a test message in Outlook. And here is how the message was received in Gmail. The migration wizard generates about a zillion 'UPGRADE_xxxx comments in the the migrated .NET code, and many of the them are pretty trivial. On our current project we've gotten a little complacent about most of the ones that aren't "'UPGRADE_ERROR:", some of the "'UPGRADE_WARNING:" messages are actually critical code breakers too. 'UPGRADE_WARNING: Untranslated statement in . Please check source code. This means that the Migration Wizard LEFT OUT some code it didn't understand, and you need to go back to the VB6 source, and copy and paste it into .NET! Fortunately this doesn't happen very often (16 occurances in 956,000 lines for us), but it leads to some ugly bugs if you don't search for all occurances of the warning message and fix them. Apparently the VB.NET 2005 Migration Wizard doesn't know how to migrate runtime licensing keys for Ocx controls. Create a one page hello world app in VB6, and add an Ocx that requires a runtime license. Migrate the app to VB.NET 2005, and compile it on a workstation with the appropriate design time license installed (I've tested this with several older Farpoint controls). Run the .NET app on the developer workstation that built it. It runs fine. Copy the compiled application to a test workstation that does not have the design time license installed, and try to run it. It fails with a license not found error. You can also copy known good OcxState data from another form with the same type of control into the *.resx files for the .NET forms. The advantage of this approach is that you don't have to rename and reposition the control on the form, but you still have to manually restore other formating and configuration properties. Bottom-line: This is a huge PITA. I really hope that there is another fix that we haven't discovered yet. Caveat: This is a Visual Basic 2005 specific solution (due to the use of generics). IIS7 has done away with the metabase, but some pre-IIS 7 applications (such as Virtual Server R2 SP1) rely on the metabase as part of their installation process. 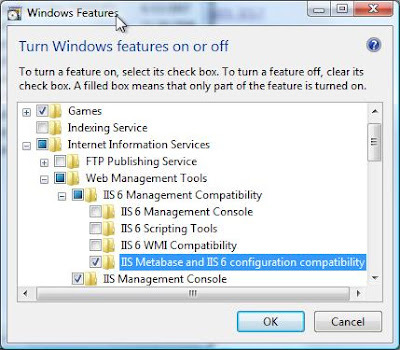 This is a Windows feature that you can turn on and off throught the control panel (it is not a seperate install). > Application Development Features and check the CGI box. An error occurred accessing the website application data folder." The solution is that you need to open Internet Explorer as an Administrator (right-click on the IE icon and select "Run as administrator"). > Under Network Adapter choose Microsoft Loopback Adapter.